Najma is a pure delight, from the beginning to the end. And unlike with the last 1943 classic that I reviewed (Kismet), I didn’t have to keep telling myself that this film could be excused for plot twists that were cliches because it must have been the first one, etc., etc. It is actually based on a very common theme, the love affair that is ruined by an arranged marriage, but if you don’t mind my adding a SPOILER in the next two sentences… Imagine a film in which that happens where the lovers don’t end up killing themselves, but where they learn to live with it and move on with their new lives (albeit after some pretty big difficulties at first)… I’m not usually one who demands happy endings, since I like deep tragedy. But sometimes I get tired of the tragic ending when I’ve already seen it done to death (so to speak), and Najma ends up steering far away from that conclusion (albeit with a bit of a crash toward the end – but I won’t give that part away now). I also found the characters in Najma and the actors who played them to be very refreshing. 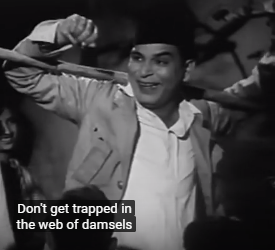 Ashok Kumar, as Yusuf, does another fine job here. He’s not as adorable all the way through as he is in Kismet (though he can be sometimes); in fact, sometimes he’ll piss you off. But, as I have said before, he is a very human kind of actor, once again playing a very human character, and he’s very good. Yakub is a lot of fun here, too. He is one of my favorite character actors in Hindi movies, and he does well here playing Yusuf’s really nice but irritating friend. (He is irritating because, for one thing, he is a bit too much of a practical joker – which is a perfect role for Yakub). Meanwhile, Veena is magnificent. It’s hard to believe that she’s only 16 or 17 here. (Although I have found myself saying the same thing about a few young actresses in these old films…) In addition to being beautiful (a fact that was apparently much talked about at the time), she exhibits a great amount of grace and maturity in her role as Najma. The character Najma, herself, displays a lot sophistication in the way she handles the changes in her life. Although she mourns her loss of a love affair, she also finds ways to make life better in her relationship with her new husband, Mukarram (played by M. Kumar). One thing that she manages to do is get Mukarram to change his habits and come home to her instead of staying out with his friends all night. 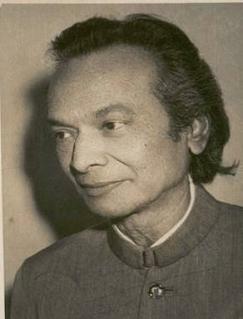 And he is a Nawab, so, especially in the world of Hindi/Urdu films, that is very impressive! Meanwhile, Yusuf continues to make his own new wife miserable. And that is a shame, because Razia is quite a woman, played by none other than the great Sitara Devi. And now that I have given a fairly extensive plot summary of the part near the end, I would like to make a brief comment about the beginning… That is the part where we get to see some of the explicit social/political commentary that we can often find in films that were made by the director/producer who had a hammer-and-sickle emblem. It’s here where we hear people overtly advocating for a society to treat everyone equally, and where we get to hear a nice prayer that is not at all flattering to the upper class. But, interestingly, the rest of the film revolves around very affluent Muslim families and dwells on the social mores of that class. 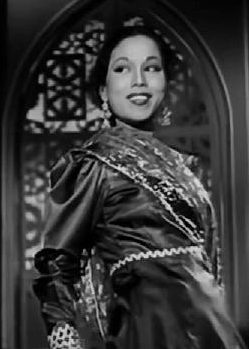 (One review that I read cited Najma as the film that created a “blueprint” for the genre known as the “Muslim Social – although there were Muslim Socials that came out earlier, such as Khandan (1942).) It is clear that Yusuf’s family has had a mixed class history (Razia is actually his cousin – and that is the reason that he is forced to marry her). But Yusuf’s father is a very successful doctor and Najma comes from older wealth, and the film takes place almost entirely within the houses of the rich. Reflecting upon this contrast, I, myself, felt that there was a slight disconnection between some of that material in the beginning and the rest of the movie. (Maybe it would have been better if the poor orphans in the beginning had been brought back a little later? Just for a little bit – I am not saying that this should have been turned into an early version of Boot Polish!) On the other hand, though, because he was focusing so much on rich people’s houses, that gave Mehboob an excuse to work with some beautifully designed sets, which complement all the other very nice elements in this highly enjoyable film. Zubaida Khanum died today. I became aware of her not too long ago, and she became one of my favorite Pakistani singers. I posted a tribute to her in February, listing my ten favorite solo songs by Zubaida Khanum and one bonus duet. I still love all of those songs, and quite a few more by Zubaida Khanum, too. RIP, Zubaida. P.S. [a couple of days later]: I have been informed that one song on the list, from Intezar, had been attributed to Zubaida erroneously. (Actually, I had attributed it to her based on a post on YouTube, and it did sound like her to me.) So, I have replaced that with a pretty newly posted song from Koel. I have also noticed that another clip is no longer accessible to me, for some reason. So, that one will probably be replaced, too.